A group of German social workers went to a village in our region and found 2 boys who showed extreme signs of malnutrition and neglect. Their skin was scabby and parts of it were white, with infected sores all over their body. The little one had an open head wound, swollen fingers and toes and a sad look about him which touched our hearts. We notified Social Welfare. Our work in co-operation with Madam Cecilia got things moving. Both boys were sent to hospital to be medically treated. Then we gave them to their Aunt Efua to care for, with instructions on how to strengthen the boys with good nutrition. After two months we saw no improvement. 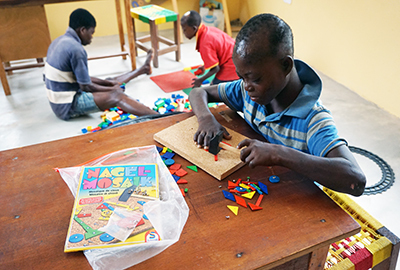 So we decided with Social welfare to bring them to Baobab, along with their 14 year old brother who has learning disabilities. The little one was often in the hospital because his head wound was always getting infected. 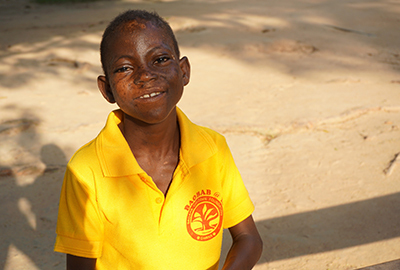 Staff and students at Baobab take care of the two boys and they are happy. They were rejected in their village. They lived like dogs, eating other people’s left-over scraps of food. They are happy with us because they are accepted, treated well and well nourished for the first time. Their fate touched our hearts and at the same time it has been a great pleasure to help them and see the smiles appearing now on their sad little faces. Madam Hannah, Augustina’s foster carer, is in charge of the boys as well. Madam Hannah now teaches a “Special Needs Class”. 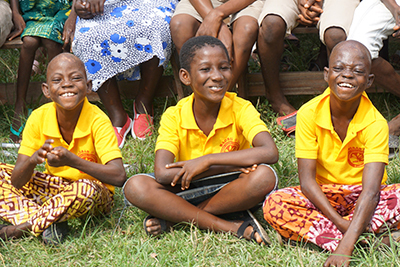 Their brother Kwesi is also in this class – the rest of the time he is helping in the kitchen, on the farm and also learning to make cane and bamboo furniture. We don’t know yet what the two little ones will be able to do in the future. Because of their stubby fingers it isn’t easy for them to hold things and already they are having problems writing because they find it difficult to hold a pen.